SureFire High-Capacity Magazines, are compatible with M4/M16/AR-15 variants and other firearms that accept STANAG 4179 magazines. 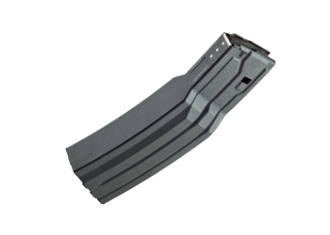 Constructed from Mil-Spec hard-anodized aluminum, our magazines feed smoothly and reliably due to optimal geometry, non-binding coil springs, and ingenious nesting polymer followers. We cannot bill to or ship hi-cap magazines to the following states and cities: California, CT, Colorado, New York, Massachusetts, Maryland, New Jersey, Aurora, IL Chicago, IL South Bend, IN Cincinnati, OH Cleveland, OH Columbus, OH Dayton, OH Toledo, OH. If you live in any of these locations, DO NOT ORDER THIS MAGAZINE.